I thought I would buck the trend that I have seen on Facebook this past week and, instead of showing you my first finish for 2013 (of which there isn't one! ), I would show you my fresh start for 2013. This was my view on the afternoon of Tuesday, January 1, 2013. I decided to start off the new year with Susan Roberts' July 4th March with the stitch guide by Amy Bunger. It wasn't a difficult decision as this project has been at the top of my To Stitch List for quite a while. I settled in for an exciting and satisfying bowl game with Georgia and Nebraska and began work on the little drummer boy who brings up the end of the march. I'll save working on his little hands and the drumsticks until I'm further along with my stitching. The drumsticks will be made from toothpicks which are cut down to the correct size and painted brown. A little glue on the ends of the toothpicks will secure a gold bead to each one and I'll have two drumsticks. Since I took the photograph, I have completed the edging around the drum and started stitching on the wagon. Lots of stitching to be done on this piece, so stick with me! I have a lot of red, white, and blue threads in my future this year! 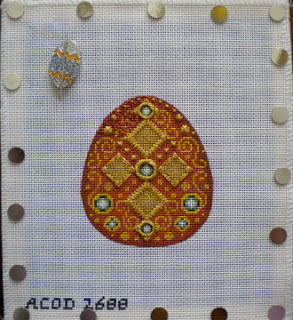 Stitching continues on my current egg in the From Russia with Love series. The metallic threads are so beautiful but also so hard on my right hand. I think I grip the needle so tightly when working on this piece that my hand begins to cramp. I guess that means I need to put it down for a little bit? I worked on adding some more background and the chain stitch scrollwork areas last night. The Kreinik 1/16" ribbon for the background is beautiful - shades of red and gold - but drives me crazy with the way it wants to twist on itself and knot up. I realized that I needed to use much shorter lengths of ribbon than I would usually choose in order to avoid those problems. It's a minor aggravation, I know, but an aggravation nonetheless. It is eagle nesting time again and bear denning time as well. I am following the eagle nest on camera in southwest Florida this year. The two eggs hatched this week and Ozzie and Harriet, the parents, are doing a great job keeping the little ones fed and warm. Ozzie delivered several catfish (huge ones!) to the nest yesterday and some unidentified road kill - opposum, perhaps? There seems to be no shortage of food for this eagle family. It's so much fun to watch a nest again. The den cams are in place at the North American Bear Center up in Minnesota. Jewel and her cubs from last year - Herbie and Fern - are on camera in their dens and Lily is on camera in her den She's expected to give birth later in the month. I have eagles and bears to keep me company on my iPad as I work at my desk each day. Great companions for the winter months! Hope your new year is off to a good start! Have a great week! Looking forward to following the 4th of July Parade. I can hear the band playing now. Lots of patriotic canvases for 2013. This one looks great. I can't wait to see more progress. Let me know when you are ready for the Fourth of July by Ewe and Eye. We will stitch side by side via the internet. What a great project to kick off 2013. The little drummer boy is so cute. Love yourt third egg. They are really a fun and quick stitch. I have the 4th of July March in my rotation and I can't wait to get to it! These pesky stockings are just bottle-necking my stitching! I can't wait to see how it progresses! About your Kreinik ribbon, I wonder if running it through a curling iron would 'tame' it a bit? It might be worth a try! Just discovered your wonderful blog! I stitched the From Russia with Love (and I actually work at Needle House). one suggestion about the 1/16 Krienik is to stretch the ribbon before using it (just a little bit) and it can help with the knotting! Love seeing your progress! Have you seen our new lightbulbs....they are really fun also!!! It Is January, Isn't It?